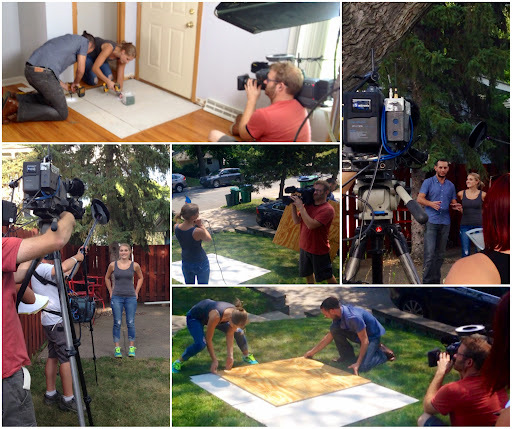 Lights, Camera, Hammers and High Heels in Action! Wanted to share a few pics, but can't share much about the details (for now?!). I know, boo-hoo! It was a ______ day for Alex and I (still can't pick a word for it, cool/ surreal/ awesome/ funny/ unordinary/ crazy/ etc.?) and I just wanted to write a little something about it here on the blog since it's the reason we got the opportunity- Well, the blog and really everyone out there that has been reading/experiencing our home DIY adventures with us. You kept us going and made every project much more fun than going at it on our own :) Thank you. Yes, it sounds kinda lame, maybe even empty as simple as it is typed out, but we truly mean it. Thank you! I know posts have been slow and a wee bit boring for a while but I'm still crazy thankful for everyone still reading. Fingers crossed, this adventure will get more interesting from here, we'll see!